Greece: a new, tougher law against racism? Greek media hailed on 07 May 2013 a proposed new bill against racism that was reportedly prepared by the Ministry of Justice and will be submitted to parliament after the Easter holiday. According to news reports (see e.g. here, here, here and here), the new bill proposes much harsher penalties for all forms of hate speech, with prison sentences ranging from 3 to 6 years and fines up to €20,000, while deprivation of political rights would be considered in certain cases. 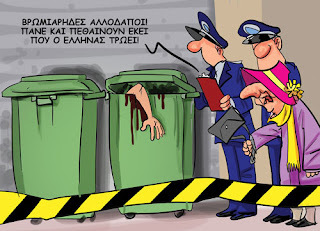 Discussion of this bill began in the public debate as it was announced that parliament would discuss lifting the immunity of Golden Dawn MP Germenis following his assault on Mayor of Athens Kaminis last week during a food distribution “for Greeks only” organized by Golden Dawn. According to the official figures of the Ministry of Interior, only 62.47% of Greeks actually voted in the June 17 elections. Participation was hardly better on 06 May, at 65.1%. Various commentators in Greece and abroad intepreted this high abstention rate in what was unanimously called “the most crucial elections in Greece since 1974” as a lack of interest in the political process or even a wholesale rejection of the political class. However, these figures are challenges by a simple fact: the number of people who are actually living in Greece. 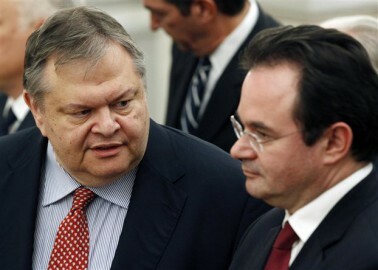 In the past few days, there have been so many changes, transfers, counter-transfers and mergers on the Greek political scene that it has all become a little confusing, even for experienced observers of Greek politics. While this phenomenon can be interpreted as simple, cheap politicking by individuals seeking to secure their re-election in June, careful examination of the backgrounds of some politicians also reveals a worrying tendency to mainstream and trivialize the opinions and positions of personalities who, by all reasonable standards, belong to the extreme-right. By @IrateGreekOn 20 May 2012, Stefanos Manos announced that his party Drassi (Action) would be joining forces with Thanos Tzimeros’s party Dimiourgia Xana (Recreate Greece) for the upcoming elections in Greece. These two parties secured respectively 1.8% and 2.15% of the vote in the 06 May elections, and can hope together to reach the required 3% to enter parliament.